The Hubble Space Telescope was used to capture imagery of GW170817, the source of gravitational waves detected on Aug. 17, 2017. On Aug. 17, 2017, gravitational waves from a neutron-star collision were detected for the first time ever by LIGO and Virgo collaborations and - in another first - light from the event has been captured by observatories in space and on Earth. 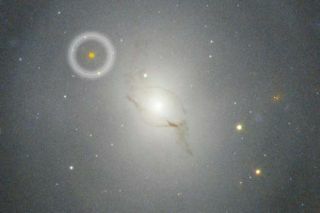 The source has been designated GW170817 and is described as a "kilonova" event. See videos of the event as it appeared through the lenses of the Hubble Space Telecope, Chandra X-ray Observatory, Gemini Observatory and more.